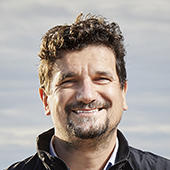 BiographyJosip Vukusic received his diploma and Ph.D. degree in photonics from Chalmers University of Technology, Göteborg, Sweden, in 1997 and 2003 respectively. From 2004 he is with the Physical Electronics Laboratory working on THz-technology. His is currently involved in modeling, fabrication and characterization of frequency multipliers and photomixers for THz generation. Dr. Vukusic has over 40 publications in journals and conferences. He has experience in areas such as device modeling, high frequency characterization and submicron device fabrication. The research fields/technology he has been involved with are vertical-cavity surface-emitting lasers, diffractive optics, quantum dots, heterostructure barrier varactors, metal-semiconductor-metal photoconductors, uni-traveling-carrier photodetectors, schottky diodes, frequency multipliers and fiber-optics. He is a co-founder of the company Wasa Millimeter Wave AB and co-applicant of a US patent on semiconductor laser technology. Has developed and commercialized a software package for the comprehensive modelling of semiconductor lasers. Has been engaged as consultant for several start-ups as well as large, established companies. There might be more projects where Josip Vukusic participates, but you have to be logged in as a Chalmers employee to see them.